Arguing that the Department of Energy lacks focus, a key adviser to President-elect Donald Trump has pitched combining the agency with the U.S. EPA in an effort to bring the "energy" back to the DOE. Doing so could save billions and serve as a part of Trump's "drain the swamp" initiative, which aims to end "special interest dealing" in federal politics. Rep. Kevin Cramer of North Dakota, who met with Trump in early December, left the incoming president with a six-page document outlining ways for the DOE to concentrate more on energy issues and less on nuclear defense and related environmental clean up activities. "The DOE is a complicated agency that lacks focus," Cramer wrote. That agency spends the majority of its approximately $30 billion budget on nuclear defense, but Cramer said it instead should focus on energy innovation, such as carbon capture and utilization technology that could help revitalize coal and other fossil fuel-related jobs. As for the EPA, Cramer argued against disbanding the agency in its entirety, as has been advocated by some of its opponents. Cramer asserted that eliminating the EPA would be difficult because the reorganization authority President Richard Nixon used to establish the agency in the 1970s was never renewed by Congress. Moreover, statutory obligations such as the Clean Air Act mean the EPA must continue to exist, and gutting the agency would be unwise because "intense public opposition" would make doing so "politically impossible," the lawmaker said. Instead, Cramer suggested that Trump work with Congress to move the EPA under the banner of the DOE, creating the U.S. Department of Energy and Environment. That approach, which is similar to one included in a bill introduced in 2012, could save billions of dollars and be beneficial to both agencies as they work on environmental cleanup operations, according to Cramer. 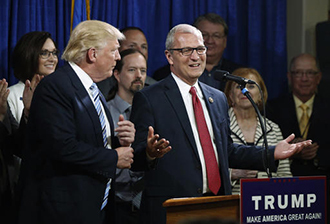 U.S. Rep. Kevin Cramer, R-N.D., right, campaigns with Donald Trump at the North Dakota Republican National Convention in Bismarck May 26. "Moving the EPA to DOE makes sense from a policy perspective since the combined agency would host both relevant regulatory and technology functions," Cramer said. "Certainly, it would be more difficult for EPA to issue regulations based on energy and pollution-control technologies that are not yet commercialized." One of the chief complaints made by opponents of the EPA's Clean Power Plan, which caps emissions of carbon from existing fossil fuel-fired power plants, is that one of the rule's compliance measures, known as generation shifting, has not been adequately demonstrated. Similarly, critics of a related rule for new fossil fuel power plants complain about that rule's reliance on carbon capture and sequestration, which they believe has not been adequately proven in the industry. The EPA would be less susceptible to outside influence from environmental groups such as the Natural Resources Defense Council or Sierra Club under the DOE banner, Cramer said. He also asserted that the "reduction of EPA's [District of Columbia] footprint" would allow states to take the lead on their own environmental regulation, which is something the EPA's opponents have long advocated. Research at the DOE could be streamlined and moved away from its current "political" focus, Cramer suggested. The program instead should be refocused on three key areas: power and grid, transport and fuels, and energy efficiency technologies. Cramer also lobbied for increasing funding to ongoing DOE efforts to modernize nuclear reactors for power generation. The agency is researching enhanced accident tolerant fuels, which could be a "game-changer" for the U.S. nuclear fleet, he said. The DOE aims to have a prototype of the fuel in a commercial reactor by 2022, but Cramer said the nuclear industry would like to see that target date moved forward to 2019, although more funding will be needed to achieve that goal. Other policy priorities Cramer advocated include lifting all energy export restrictions that are under the DOE's jurisdiction and improving access to fossil fuel energy. Cramer also would like to see a comprehensive study conducted between DOE and FERC on the early retirement of coal and nuclear baseload generation.